Logo of Trinity Industries, Inc.. Image available on the Internet and included in accordance with Title 17 U.S.C. Section 107. 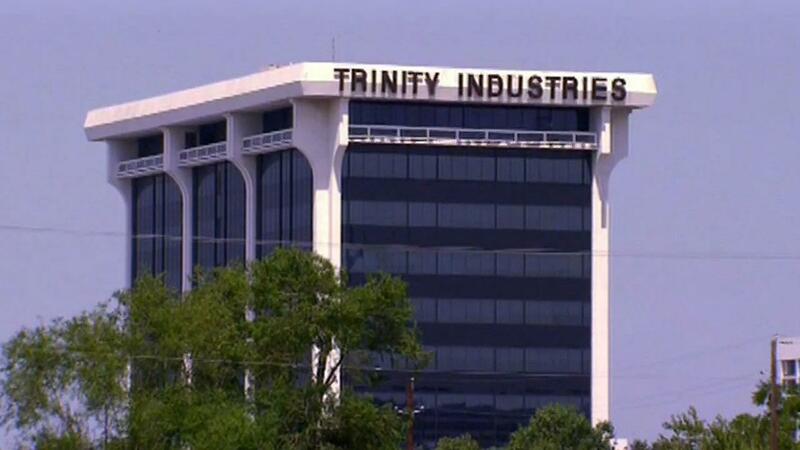 Trinity Industries. Courtesy of Trinity Industries. Image available on the Internet and included in accordance with Title 17 U.S.C. Section 107. TRINITY INDUSTRIES. Trinity Industries, Inc. is a diversified industrial company that owns complementary, market-leading businesses providing products and services to the energy, chemical, agriculture, transportation, and construction sectors. The company, first known as Trinity Steel, was founded by C. J. Bender in Dallas in 1944. W. Ray Wallace, an engineering graduate of Louisiana Tech joined the company in 1946 as its seventeenth employee. At the time, Trinity Steel manufactured butane tanks in a Dallas County mule barn. In 1958 Trinity Steel merged with Dallas Tank, a competitor tank company founded in 1933, to form a new public company - Trinity Steel, Inc. Ray Wallace was selected to lead the new organization. Between 1961 and 1970, Trinity added 15 companies or manufacturing plants, most of which were tank manufacturers. The non-tank companies were related in some tangible way, using similar materials and processes. In 1962, the company employed approximately 490 employees and its sales and net income were the highest in its history. In 1967, the company’s name was changed to Trinity Industries to reflect its growing diversified product lines. In 1970 Trinity diversified with the acquisition of 153 acres of land adjacent to the Dallas-Fort Worth International Airport and in 1971 established its first real estate subsidiary. In 1972, Trinity’s stock began trading on the New York Stock Exchange under the symbol TRN. Acquisition of Mosher Steel in 1973, after initially contracting work out to them, enhanced the company's structural business. Among projects completed by the firm's structural steel division were the Texas Stadium, New York's World Trade Center, the Balboa Bridge in Panama, the Pennzoil Building, and two buildings in Moscow. By the 1980s two subsidiaries, Gamble's Incorporated of Alabama and Mosher Steel of Texas, manufactured structural products including materials for drilling platforms, highway bridge components, commercial-high-rise buildings, and other girders and beams. The firm's marine subsidiary, Equitable Shipyards, produced LASH or Lighter Aboard Ship barges, riverboats for use by Hilton Hotels, and other craft for industrial uses. Hackney, Inc., its metal components subsidiary, produced materials for piping systems. Trinity produced completed railcars, including tank cars, hopper cars, and gondolas to transport chemicals, coal, and other substances, at locations in Oklahoma City, Oklahoma, and Longview, Texas, and held two railcar leasing subsidiaries. The company also produced containers for fertilizer, liquefied petroleum gas, and nuclear fuel and waste. In 1981 the company acquired a metal fabrication firm at Channelview, Texas, and Babcock and Wilcox plants in Elkhart, Indiana, and Koppel, Pennsylvania, and in 1983 it acquired Halter Marine. In the 1990s expansion continued with the acquisition of the Transit Mix Concrete and Materials Company of Beaumont, Texas, Beaird Industries, Syro Steel, and Stearns of Fort Worth, Texas, a major producer of airport equipment. By 2000, Trinity had a total of 76 manufacturing plants in 21 states, Mexico, Romania, Argentina and Brazil and had diversified further by owning 123 concrete and aggregate locations. A year later, the company merged with Thrall Car Manufacturing Company. Trinity reentered the wind tower structure business in 2004. What began as a small butane tank manufacturer in the 1930s has grown into a diversified industrial company whose businesses serve a variety of sectors. Today, Trinity reports its financial results in five principal business segments: the Rail Group, the Railcar Leasing and Management Services Group, the Inland Barge Group, the Construction Products Group, and the Energy Equipment Group. Its common stock is traded on the New York Stock Exchange under the symbol TRN. Who's Who in America, 1978–79. Handbook of Texas Online, Diana J. Kleiner, "TRINITY INDUSTRIES," accessed April 24, 2019, http://www.tshaonline.org/handbook/online/articles/dkt02. Uploaded on June 15, 2010. Modified on February 20, 2018. Published by the Texas State Historical Association.